Baird’s Tavern is one of 21 historic sites within the Village of Warwick now a part of a self-guided walking tour offered by the Warwick Historic Society. 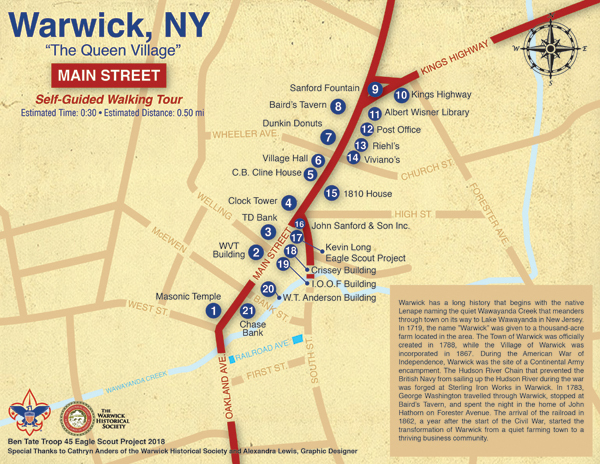 WARWICK — The Warwick Historical Society is excited to announce the release of four self-guided walking tour maps of the Historic Village of Warwick. Ben Tate, a prospective Eagle Scout approached the Historical Society in 2017 with the project and the society quickly jumped on board. Tate worked tirelessly researching the many historic buildings in the village using the society's archives; walking the routes numerous times with other scouts and working with Alexandra Lewis, a local graphic designer, on the layout of the four maps. Growing up in the scenic landscape of Warwick, Tate developed an appreciation for the Village of Warwick’s culture and its rich history. He joined Scouting as a Tiger Scout in first grade. He earned the BSA rank of Eagle Scout in August 2018. Tate is a graduate of Warwick Valley High School, Class of 2018, and currently attends Purchase College in Purchase. Lewis, a friend of the Tate family, is a Graphic Designer based in Greenwood Lake, who empowers the unique ability to manifest an idea and move it to a visually-pleasing printed hard copy. Visit her at WanderingHeartDesign.com. The maps can be found on the Warwick Historical Society website, www.whsny.org or hard copies can be borrowed at the A.W. Buckbee Center, 2 Colonial Ave., Warwick. A limited number are also available at the Warwick Chamber of Commerce located in Red Caboose on South Street. In addition to the hard copy maps, the Society is launching a digital tour of the historic properties in the village. Visitors will be able to click on a QR code and download the app on their phone and listen to the stories of many of the buildings located within the village. This project was made possible by a grant from Humanities NY with Project Manager Roger Moss, Peter Lyons Hall of Warwickinfo.net and a tremendous team of volunteers: Danielle Barbour, Tom Brennan, Patricia Dooley, Marty Filipowski, Marilyn Hayden, Jim DeSotle, James Weatherstone, Phil and Rita Laskin, Paul Woods, Zach Garby, Patrick Sheils, Lara Drozdowsky, Kathy and John Skafidas, Jenny Torino, Gia Farruggia and Kat Nitchke. For more information about the Warwick Historical Society, call 845 986-3236 ext. 106 or visit www.whsny.org. Masons bought building and completely remodelled it. First communication held at the Masonic Temple was April 24, 1928. The iconic symbol of the Masons is the Masonic Square and Compasses, found with the letter G, is prominently visible on the south side of the building. Prior to the incorporation of Warwick Valley Telephone Company in 1902 the entire town was served by a single public telephone located in a drugstore on Main Street. This brick building originally housed the Warwick Savings Bank which moved to 18 Oakland Avenue in 1974. Its first structure was a wooden building which was operated by the founder and first president, Grinnell Burt, from 1875-1927. The current building was constructed in 1926, four years before the Great Depression. MDCCCCXXVI is carved in stone above main entrance. Originally built in 1867 as a Methodist Church. It once had an enormous steeple which was at least double the height of the current tower. After multiple lighting strikes, the steeple was removed and the tower constructed in 1917. Wood frame clapboard house built about 1830. In 1875, local cabinet maker, C.B. Cline, became resident. Structure was one of a line of residences along Main Street, replaced by businesses in the mid-20th century. By the 1970s, this house served as a funeral home. Oftentimes, the cabinet maker in the area would perform the duty of coffin maker. He had the tools and skills to build both items made of wood. Wood frame clapboard Greek Revival building with its row of tall columns and pediments originally served as the Dutch Reformed Church at 16 Maple Avenue. Built in 1848. Moved to this current location in 1890, served many purposes before it was purchased as Village Hall in 1908. Two large residences were previously located here between Wheeler Street and Baird’s Tavern. They were demolished to make way for a Chrysler car dealership in 1957. Note date high above entrance. This stone building was constructed by Francis Baird in 1766. The location at the junction of roads from Newburgh, Goshen, and New Jersey was a perfect location for a weary traveler. George Washington has been noted to have stopped here on his travel from Philadelphia to Newburgh. His wife, Martha, stayed overnight on July 27, 1782. The building was privately owned until 1940. The main floor currently serves as a working tavern. Open daily at 4 p.m.
Fountain located on the island where Main Street and Kings Highway meet was placed in 1903 by the children of George W. Sanford, who was the member of board of directors of Warwick Savings Bank. Perfect location for water trough for horses. All roads named KINGS HIGHWAY were official pathways for travel. Residence and shop owners along the designated path were required to maintain their portion of the route. The road was typically scaled to form the width of 10-12 men standing shoulder to shoulder as they marched. Originally this was the public library, built in 1927. The current library stands on McFarland Avenue. This brick masonry building was constructed with an endowment from Mrs. Albert Wisner herself in memory of her loving husband who was born in Warwick and made a fortune in Chicago real estate. Now, the building is home of the Warwick Historical Society. Open 10 a.m. - 2 p.m. Monday-Friday. This brick building, not typical of the Federalist Colonial Revival style which was popularized by the country’s Centennial celebration in 1876 and common through World War II, was built in 1967. Modern building. Built 2014. Evokes same style of original structure which was built 1820. Wood frame clapboard simple vernacular house. The original construction served as a hat factory for John McKee, the local hatter. Wood frame shingled 2 1/2 story house was built in 1817 and sold to a local hatter, John McKee. This building was considered an early Federal-styled residence, which has undergone many renovations but still retains the original door trim. Circa 1780 by U.S. Department of Interior, this building was placed on the National Register of Historical Places, as are most of the older structures located in the historic district of the village. Built in 1810 -1812. Wood frame clapboard 1 1/2 story Connecticut saltbox style house with Federal details. This Federal-styled home dominated the American architectural landscape from 1780-1820. The most significant feature of this structure is the simple square or rectangular box shape. Unique, triangular 3-story brick building with windows of Roman lintels and keystones stands at the point where Main, South, and High Street merge. Originally built in 1870. Major fire in 1879. This building, rebuilt circa 1880, landmarked the arrival of the village post office and was later occupied by the John W. Sanford and Son Insurance Company in 1890. Wooden covered trash cans along Main Street. Eagle Scout is highest ranking in Scouts. Designation “Eagle Scout” was founded over 100 years ago. Only 4 percent of scouts are granted this rank. This structure served as a commercial building, and one of the sites of Warwick Savings Bank. This bluish-gray, wood-frame clapboard building with white trim was built circa 1860. With IOOF No. 34 marked on its exterior, this building is announcing The Independent Order of Odd Fellows (IOOF). An organization whose primary purpose is to promote good will and harmony amongst peoples and nations was originally founded in North American in Baltimore, Maryland, on April 26, 1819. In August 8, 1867, the Warwick’s own chapter was instituted. Meetings are held on the third floor. Three-story building was constructed in 1890 by W.T. Anderson during a time when several concurrent forces contributed to the popularization of the Romanesque Revival in the United States, featuring rounded arches and vaults and the substitution of piers for columns. The slate roof defines each floor, and the elaborate carved woodwork adds refinement to the trim. Initially built and operated as a department store. In 1978, modern alterations, such as plate glass windows and modern store front, were made. First National Bank on corner of Main Street and Bank Street was founded in 1864. Sat conveniently near the once busy freight yard, where the parking lot is. In its prime, this bank had a very elegant public lobby. Note bene: For better viewing of downtown structures stand on the opposite side of the street.